Will the Missouri Tigers basketball team ever win again? It’s a fair question to ask. The Tigers dropped yet another contest this afternoon; this time to the Texas A&M Aggies. 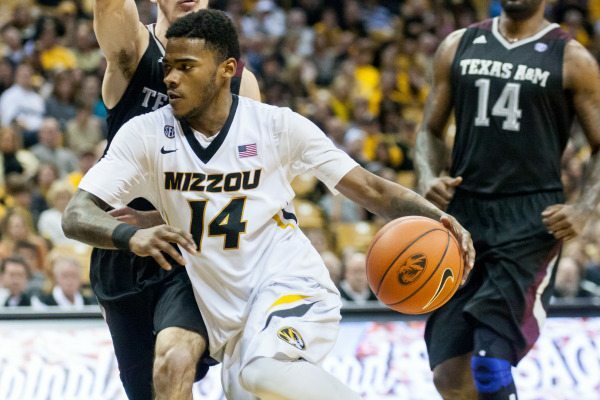 Missouri, with a short bench had no answer for the Aggies as they would go on to lose its ninth game in a row 83-61. Prior to the game Missouri head coach Kim Anderson suspended freshman Montaque Gill-Caesar and Namon Wright for a violation team rules. Tramaine Isabell remained suspended for the third straight game for poor behavior leaving just eight scholarship players on the Tiger bench. The Tigers played good basketball for most of the first half. Keanau Post earned another start coming off a team high 11-point game last time out against Alabama. He added eight points and five rebounds, while limiting himself to just two fouls. Holding a one-point lead the Aggies used a 7-0 run to pull away midway through the first half. Danuel House had 14 of his game high 20 points in the opening frame. A three-point jumper from Keith Shamburger and a pair of free throws from Jakeenan Gant helped the Tigers cut the deficit to 28-25 with four minutes remaining, but that’s the closest they would come. At the break Texas A&M held a 38-31 advantage. In the second half the Tigers tried to mount an early comeback, but they were unable to match the Aggies consistent shooting. Texas A&M had four players in double figures on the afternoon and shot an incredible 58.9 percent from the floor en route to the 83-61 victory. Wes Clark was the high scorer on the Missouri side recording 15 points and six assists. Gant was the only other player in double figures for the Tigers with 10 points. Missouri also continued to struggle from behind the arc shooting a woeful 17.6 percent. Anderson addressed the media after the game in a positive manner focused on fixing the character issues. It’s hard for any team to shake a losing drought as deep as the one Missouri is in, but Anderson is definitely going to do it the right way. Regardless of how many players are on the bench he’s made it clear that if you want to play you’re going to have to bring the right attitude. No matter how bad the Tigers are playing at home or on the road Anderson will strive to put a respectable hard working team on the court night in and night out. He’s made a point about doing it the right way and that’s certainly a good sign for the future. Up next the Tigers travel to South Carolina to take on the Gamecocks.